Mississauga is Canada’s 6th largest city with the population of over 713,000. This fabulous city covers a huge area, sits right next to Toronto and fronts 13km of shoreline on Lake Ontario. It’s simply a fun, vibrant place to live in, visit or play. If you’re thinking of relocating to Mississauga and need to find a reliable real estate agent to represent your best interests – get in touch with me today. Honesty, integrity and dedication are a few words that round out my approach. Square One Shopping Centre – one of the largest shopping malls in Canada, with over 1.6 million square feet of retail space and more than 360 stores and services. Living Arts Centre – houses performance theaters an exhibition gallery, seven professional art studios and corporate meeting facilities. 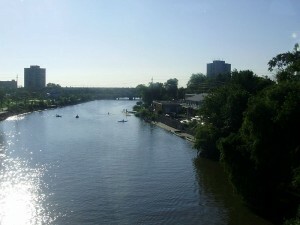 Port Credit – hiking on Lakeshore Road, window shopping, walking your dog, shopping at Farmers Market, dining in its restaurants, staying in Waterside Inn, sailing and visiting many of its festivals. Carassauga Festival – Every year we have a festival here where you can visit the different pavilions of different nations. Usually this takes place at the end of May. Purina National Dog Show during March Break – It is Canada’s most prestigious dog show, with top international judges on hand as hundreds of purebreds from around the world compete for their share of honour and prize money. It is perfect for dog enthusiasts and families looking for some March Break fun. Mississauga Waterfront Festival – Every year we have a great festival, with rides, music, and a lot of stuff for the kids to do! This usually runs the Canada day long weekend. CN Tower – it remains the tallest free-standing structure in the Western Hemisphere, a signature icon of Toronto’s skyline, and a symbol of Canada,attracting more than two million international visitors annually. Hershey Centre – multi-purpose sports and entertainment complex located in Mississauga, Ontario, across the street from Iceland Mississauga. Playdium – the main building is 40,000 square feet featuring more than 200 of the most popular games, amusement rides, and simulators. Credit River – home to a wide range of wildlife. Walk along the river or travel by canoe or kayak. Adamson Estate – a public park on the Waterfront Trail and a Canadian historic place. Did I miss something? Do you have your favourite place to visit or a fun activity to do in Mississauga? Share your comments.